512 pages | 66 B/W Illus. Understanding inventory—its costs, its place in the supply chain, and what is considered its optimal level—is important to an organization’s profitability. Demonstrating how each link in the supply chain plays an integral role in the success of the whole, Rightsizing Inventory examines inventory throughout the entire internal and external supply chain. The book covers every aspect of inventory. 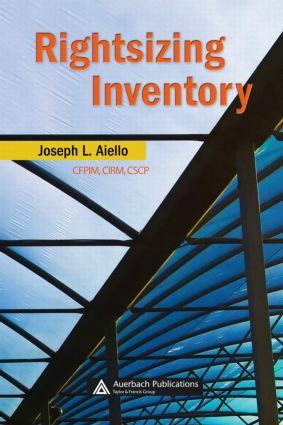 Each chapter defines roles and responsibilities, identifies methods to improve collaboration, and presents the tools, techniques, and methodologies for each link.The book includes150 TIPS on "How to Rightsize Inventory,” and examines the areas of finance, accounting, sales, marketing, planning, purchasing, manufacturing, warehousing, transportation, distribution, facilities management, human resources, information technology, product engineering, process engineering, field service, quality, and the external customer. Providing a complete overview on inventory and its place in the supply chain, Rightsizing Inventory is an important resource for those involved in making that supply chain run smoothly and profitably. How Much Inventory Should We Make or Buy? How Much Inventory Should We Make? How much inventory should we stock? What Information about Inventory Do We Need?